The Scramban Family Planner is for all families that want to stay organized and complete ordinary tasks in an educational and fun way. The board is the heart of the Family Scramban planner. The family gathers round it every morning/evening to recap the past and plan the future. It tells us at a glance if we’re on track this week, or falling behind in our work goals and responsibilities. The board is divided into three columns. The column headers are: “To Do”, “Today” and “Done”. There is a row for each family member. You will design the rows yourself depending on the number of family members and use a people icon to represent each member (http://www.faceyourmanga.com/). Each family member has her/his own family face icon. You can either use the ones that come with the kit or make your own. At the beginning of the week typically at Sunday night, the whole week is planned and the goal is set. You decide which tasks need to be completed in the coming week. All cards start at the far left, in the “ToDo” column. You can either use the predefined that come with the board or make your own for example improving social skills, spending more time outdoors, cleaning the garage etc. As the week progresses, team members move their cards rightward in their own row to “Today” as tasks get completed. Once every day there is a short status meeting where everyone explains what they have done since last meeting and explain what they are going to do until the next meeting (1 meeting every 24 hours). At that meeting the cards are moved from ‘Today’ to ‘Done’ as the family accepts that the task has indeed been completed. The weekly goal is typically intended for the whole family and the prize should be something that is enjoyed together. Each task represents 1 point and if the weekly family goal of 30 points is reached the whole family gets the prize. The goal can also be personalized for one family member i.e. if waking up in the morning is a serious problem and the goal of waking up by themselves is set and completed successfully they can get an extra reward which has been decided beforehand. The underlying methodology is Scrum/Kanban which is well known in Software development all over the world. 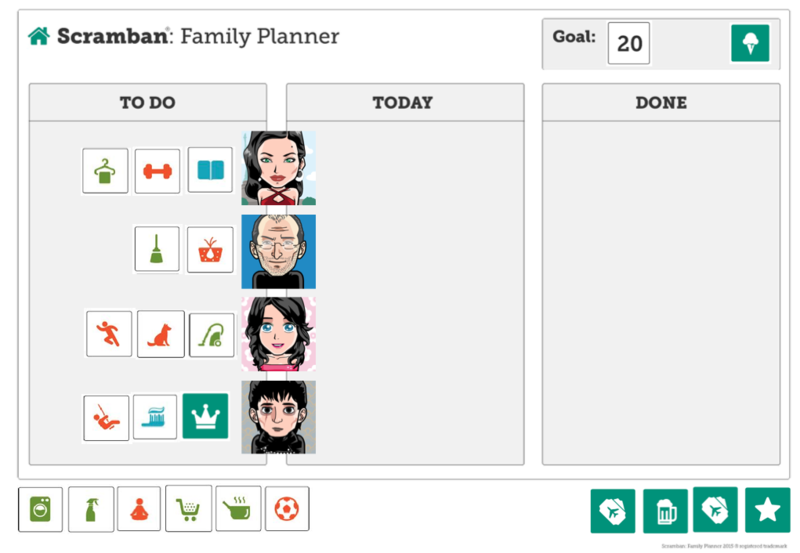 The founders of Scramban Family Planner see the board as an easy way of organizing those pesky tasks that need to be completed in the daily family life and improve the overall happiness of the family members (no more nagging, crying or complaining). It raises the awareness of what needs to be done each week, what can be improved and who can resolve the issues other than the usually default one (who always gets the ‘cooking’ or ‘car repair’ card? ).